...that Val Ca'uor was the last Dominus of the Red Legion? 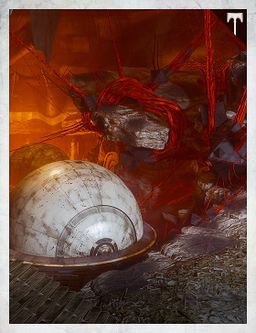 "Fallen seek to improve their station within the Splicers’ quickly-evolving caste by making offerings of dormant SIVA to the Forge. Their worth is then tested in a trial-by-combat." The Archon's Forge is an Arena that can be initiated as a Public Event in the Plaguelands. In order for an event to start, Guardians must insert SIVA Offerings of various rarities into a small console on the far right side of the lobby, which closes off after an event starts. SIVA offerings can be found by killing Fallen Captains in the Plaguelands, as well as randomly dropped during Archon's Forge events. Once an event has started, players will engage in a brawl with Splicers that last up to five minutes in length. These enemies must be killed in time for a boss to appear at the end of the round, as indicated by the percentage bar in the upper left corner of the screen. There are three tiers of bosses: Fused, Enhanced, and Perfected. Each tier is more difficult than the last, but the more difficult the boss is, the greater the rewards will tend to be for killing them. If a player dies during the event and then respawns themselves as opposed to waiting for a revive from a fellow Guardian, they then have the option to rejoin the fight by inserting a Splicer Key into the console to unlock the entrance. or waiting until the current fight is over to join again. The easiest way to do these fights is by entering the area slowly once you begin entering the tunnel at the back of the The Archon's Keep so that the game can load other Guardians in to fight alongside you. This is the easiest difficulty, with a recommended Light level of 320. Fused bosses usually don't last long in battle and are killed quickly, especially with the use of a flaming axe, a Rocket launcher, or a Super attack. These offerings are typically the easiest to do solo compared to the other two levels of difficulty. These can only be summoned by inserting a Fused SIVA Offering into the console right next to the arena. This is the middle ground difficulty, with a recommended Light level of 340. Enhanced bosses are slightly more durable than Fused bosses, but still take relatively little firepower to take down. It is pretty hard for one player, but pretty easy for two or more players. They can only be summoned by inserting an Enhanced SIVA Offering into the console right next to the arena. This is the hardest difficulty of SIVA offering, with a recommended Light level of 360. Perfected bosses have very high durability and attack power, so they require lots of concentrated firepower to bring down as a result. These are almost impossible for one or two players, even if they are both light level 400. 3 high light players or 5 lower light players will beat it if they try hard. They can only be summoned by inserting a Perfected SIVA Offering into the console right next to the arena. There are at least two patrols available in the Plaguelands that require passage through Archon's Forge in order to obtain the necessary information or locate a specific ""bounty" or "target". One of these missions requires a Splicer Key which opens the entrance to the Forge. Once either one of these patrols have been completed the player has to backtrack through the Forge to make it back to the Plaguelands. In some cases there may be a battle already taking place when the player reaches the arena from the Warrens. If this is the case one has several options to choose from. If one's Light level is relatively low and/or they feel unprepared just fall back about 50-100 feet down the small tunnel and wait for the battle to play its course. The longest the battle may last is five minutes but usually its over relatively quick, especially if there are experienced Guardians. Another option (and an extremely sneaky one) is to do exactly as mentioned in the first option: Fall back and wait. One place to wait it out is the opening of a small tunnel. Making sure not to be seen by any baddies and dodging incoming fire, take careful aim and chuck a grenade of any sort or fire a shot or two from any weapon into the chaos. Doing so will automatically include the player Guardian to the team once a target's been hit. After this, quickly head back down into the small tunnel, avoid incoming fire and wait for the battle to end. If done correctly, when the battle is over and the dust is cleared the player will get rewards. However this is not as rewarding as the last option and the playes that actually contributed to the fight won't like you. The last option is to join the fight. The player can do this one of two ways. Stay at the entrance of the small tunnel and pick off any enemy that runs by, occasionally backing into the tunnel to recover health, switch weapons or shake off jitters. The second way is to come out of the small tunnel guns blazing or sword swinging and join the chaos. There are numerous enemies everywhere and can overwhelm the unprepared. Just remember to check health and where that small tunnel is located every so often. If the player has an awareness of the battlefield they can retreat quickly to safety. Look for the huge arching threads of red SIVA string banded together to make one large one. Find it and the tunnel is located right above it. The small tunnel is the only spot in the arena where the player are completely safe from incoming fire and, nothing will attack from behind. After the battle is over there will be ammo scattered all over the arena along with a couple engrams. Other Guardians will begin a new battle or leave, meaning one can sometimes face an onslaught of enemies alone. Depending on the potency of the SIVA offering it is possible to do it alone, but it is recommend to bring a fireteam or wait for a group of others.